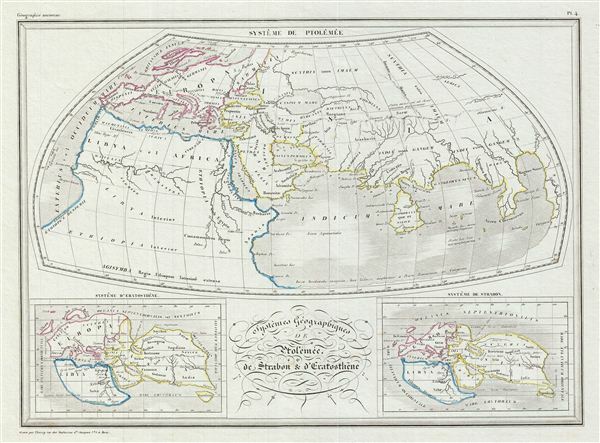 Systemes Geographiques de Ptolemee, de Strabon et d'Eratosthene. This is a fine example of Conrad Malte-Brun's 1843 map of the Geographical Systems of the ancient Greek geographers Ptolemy, Strabo and eratosthenes. Of course, the world of the ancient Greeks centered on the Mediterranean and the Americas had yet to be discovered. europe, Asia, and Africa were however known leading prominent geographers of the ancient world to adopt a three part world model – a system that would remain in use until the era of Martin Waldseemuller in the early 16th century. The map is divided into three sections with the largest, top center, illustrating the geographical system of Alexandrian geographer Claudius Ptolemy. The section in the lower left quadrant depicts the system of eratosthenes and the one in the lower right quadrant depicts the system of Strabo. It is worth noting the superiority of the Ptolemaic system which would come to dominate european cartographic presentation until the discovery of America. This map was issued as plate no. 4 in Conrad Malte-Brun's 1843 Precis de la Geographie Universelle.